The warmer water temperatures usher in the diving, fishing and boating season. I look forward to swimming through bait balls, seeing the Spadefish finning the surface as they school around the tops of shallow wrecks. With the abundance of fish comes all the great fishing tournaments we have throughout the region. One of the largest and most exciting tournaments this year will be during Florida’s annual Lionfish Removal and Awareness Day festivities, taking place in Destin Florida. The Emerald Coast Open will be one of the richest lionfish tournaments ever held. Last years Lionfish World Championship, held the during the L.R.A.D. was a huge success setting at least three world records. You get people’s attention when you remove nearly 10,000 invasive fish in two days. This initiative is gaining larger corporate sponsorship which more appropriately rewards these hunters for their efforts and the risks they take. If you participate in these hunts, and really all dives, you must have oxygen available, have an Emergency Action Plan to include a recompression chamber, and Divers Alert Network’s dive accident insurance can be very useful. This tournament should bring in some very impressive numbers. The fish have not been hit very hard lately, and we in the northern Gulf of Mexico have the highest concentrations seen to this day. The prevalence of lionfish in the northern Gulf of Mexico has lent the area to become a hotbed of innovation in the harvesting, research, and commercialization of these gorgeous, tasty, interlopers. We have some of the best, most efficient hunters, quickly surpassing the veteran south Florida divers. This proves the age-old adage, “practice makes perfect”, rings true. Along the Gulf Coast numerous universities, local and regional, are doing research on where they live, what they eat, what slows them down and much more. In Escambia County we have three high schools doing DNA profiling of what lionfish eat. These kids have a database of over 5000 prey species proving cannibalism and providing information of what they prefer to eat. Local non-profit, Coast Watch Alliance has been focused on the commercialization of Lionfish. 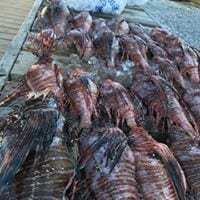 Bringing buyers to the last tournament that paid the lionfish harvesters 25-50% more money than usual for their catch. They have been doing dinners showcasing lionfish at numerous finer restaurants throughout the region at their “Venom and Vino” series. Now they are poised the bring the concept to less upscale establishments with their “Taste the Invasion” initiative. These efforts are extremely important if we are going to create a market for these fish. We want people to try them, once see just how tasty they are, and how easy they are to cook, the market will be self-sustaining. Look for one of these events near you. Coast Watch Alliance plans to bring the Lionfish World Championship back as a series of events in the near future. In the mean time make it on down to the Emerald Coast Open in May. Come out to see what is happening on the frontline of the lionfish invasion, eat some, and tell your friends.